The cool Californian surfer girl look, all sun-kissed highlights and salt water textured light waves, rocks. So why is it, that when you get back from the beach, your hair looks as bad as it feels: dull, dry and rough like straw? May be because these mermaids have a few savvy tricks to keep their locks glossy and silk soft, such as a post beach mega moisture-boost coconut oil hair pack. This amazing oil, according to Indian researchers, is the best to sublimate your strands. Their studies show that, unlike sunflower oil or mineral oil, coconut oil reduces the protein loss for both undamaged and damaged hair when used as a pre-wash and post-wash grooming product. Its cute, minute molecules are the only ones able penetrate inside the hair shaft. So, after a day on the beach, to rescue your distressed tresses and restore your crowning glory to its former beauty, prepare a repairing, regenerating and softening hair pack. Rinse your hair, then warm up 3 or 4 tablespoons of coconut oil in a double boiler. And boost its beautifying benefits, with 10 drops of essential oil of Ylang-Ylang, 3 drops of essential oil of geranium Bourbon (aka Pelargonium Graveolens) and 3 drops of essential oil of chamomile. Mix thoroughly and massage your scalp, then your hair with this magic potion, gently rubbing it to ensure full penetration. Wrap tightly with cling film and hide it under a delightful towel or a fetching turban. Let the beautifying concoction work its wonders for an hour or more - ideally, the whole night if Raymond is away. Shampoo and finish this awesome hair care session with a mind-blowing last rinse: take a large bowl of cold water, add 10 drops of essential oil of chamomile, stir and pour on your hair. Dry and admire the softness of your shiny, sparkling and stunning mane. 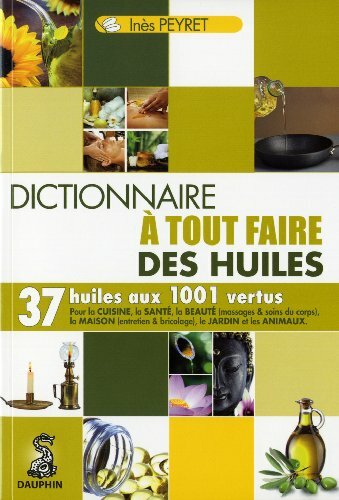 Le Dictionnaire à tout faire des huiles.